The pinewood derby is an annual event that Cub Scouts have been taking part in for decades. 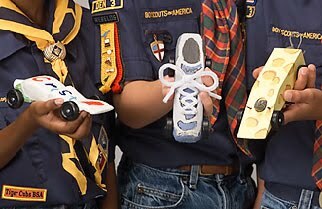 Each scout, with assistance from a parent, builds a model car and races against other Scouts in the pack. This is meant to be a project that parents and sons do together. The amount of effort put in by the Scout vs. the parent depends on the age of the scout. Clearly, you are not going to have 1st graders using power tools. As the scouts get older, they can do more on their own. The scout should do as much as possible based on his age. Building a pinewood derby car takes time – don’t leave this for the last minute. We abide by the Huron District Pinewood Derby Rules found at his link: District Rules. The scouts, siblings & adults will register their cars at the check-in before the races begin. Each car will be inspected to verify that it meets all of the rules. Any car breaking any of the rules will not be allowed to race. Cars will be impounded after registration and no further work, lubrication or modifications will be permitted (exceptions on a case by case basis may be permitted for damage to cars which occurs at no fault to the owner). The pack can send one boy from Tigers, Wolves, Bears, and Webelos to the Huron Trails District Derby. The fastest car from each rank will be selected. If any of those scouts can not make the District Derby, then we will go down the list (1st, 2nd, 3rd, etc.) to determine who goes to the District Derby. Our track is equipped with a timer & race software. Each car will race 4 times (once in each lane of the track). The software will total the times for each race to determine each cars overall time. The smallest three total times will determine 1st, 2nd & 3rd place. Timing the races and racing equally across all 4 lanes is the fairest way to determine winners. A first, second & third place trophy will be awarded at each rank level for the scouts. No trophies for siblings or adults will be awarded. There are lots of web sites with tips & tricks. Go to http://www.google.com and search for Pinewood Derby. Just make sure you follow the rules on this page. The body of the car must be from the official kit supplied by the pack in December. The body may be shaped, hollowed out, or built up from the original block as long as it meets the other specifications. Any additions to the body (weight, decals, steering wheels, etc.) must be firmly attached to the car. No shifting weight shall be allowed. You can not modify the width or axle length. The width of the car at the wheels must not be changed or modified. It must remain 2 ¾” as in the original kit. The width between wheels must be 1 ¾”. The length of the car may not exceed 7”. The bottom clearance between car and track must be 3/8”. The total car height including any additions must be 4” or less. You must use the official wheels and axles that came with the kit. No washers, hubs, bushings, bearings or springs shall be allowed. Wheels and axles may be sanded to remove flashing & burrs only. No reductions in width or diameter or changes in shape will be allowed. No rounding of the wheels will be allowed. All four wheels must touch the ground when the car is laid flat. Only dry powdered lubricants may be used, and must be applied prior to check-in. NO liquid lubricants allowed. The weight at check-in must not exceed 5 oz. as determined by the official pack scale. All cars must be checked in prior to the start of the race, if the car needs adjustments in weight or in any other way, it can be done so up until the start of the race. The official pack scale will be available at the Derby starting at 5:15 pm immediately before the race which will start at 6:45 pm. Any unsportsmanlike conduct by the scouts, siblings or parents shall be grounds for disqualification. All decisions of the track judge and check-in judge are final. Scouts must race a car built in the past 6 months - no racing cars from prior years. (Adults are exempt from this). No pre-made or e-bay cars are permitted. The only rules for the Open Race is that the car cannot exceed 5 ounces. All other rules are optional including pre-made or e-bay cars.